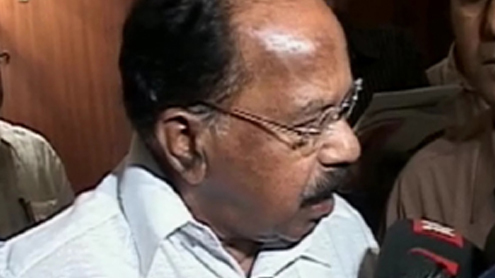 New Delhi: As public outrage builds over the CBI’s decision to close the Aarushi Talwar murder investigation, Law Minister Veerappa Moily has met the agency’s director, Amar Pratap Singh, and told him to take the case seriously. On Wednesday, the CBI told a Ghaziabad court that it wanted to end the investigation because it does not have enough evidence against anyone. It has not been able to establish the motive for the killings, or recover the murder weapons. The court will indicate whether it accepts the CBI’s decision. Aarushi’s parents said they were shattered with the CBI’s attempt to abandon the case. Aarushi Talwar, 14, was found dead in her bedroom in Noida in May 2008. Her throat had been slit while her parents were sleeping in their room next door in their flat in Noida. At first, the Noida police suspected the Talwars’ domestic help, Hemraj. However, a few hours later, blood stains on the stairs leading to the terrace of the building led to the discovery of Hemraj’s dead body. The Noida police allowed the media complete access to the terrace – as a result, critical evidence was ruined. A few days later, Aarushi’s father, dentist Rajesh Talwar, was arrested by the police, which suggested he had killed his daughter because he had found her in a compromising position with Hemraj. Child rights’ activists attacked the police for its unfounded and invasive statement. Amid public outrage, and at the request of UP Chief Minister Mayawati, the double murder investigation was then handed to the CBI. Dr Talwar was released from jail in July 2008 after the CBI admitted it had absolutely no evidence against him. However, both Rajesh Talwar and his wife Nupur, were put through lie detector and brain mapping tests. Between June and July 2008, the CBI arrested three domestic helpers who were known to the Talwars. Krishna worked at Rajesh’s dental clinic, Raj Kumar was employed by the Talwars’ closest friends, the Durranis; and Vijay Mandal worked for a family that lived in the same apartment building as Aarushi. The three men were put through narco-analysis. They did not implicate themselves or each other. The results of brain-mapping and narco-analysis are in any case not admissible as evidence in court. All three men were released in September 2008 after the CBI said in court that it had no evidence against them.